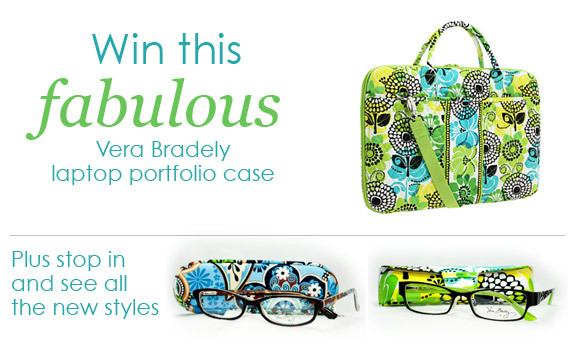 If you like Vera Bradley (and we know you do), you’re going to love this! Not only do we have new styles in store, but we’re also giving away this Vera Bradley Laptop Portfolio in “Lime’s Up,” one of Vera’s freshest summer prints. We’re accepting entries between now and July 13th. Anyone can drop by and enter the giveaway, but purchase Vera Bradley frames or sunglasses to increase your chances of winning. Besides, with so many cute styles in stock, each with an eyeglass case in a matching Vera Bradley print, you’re bound to find at least one you’ll want.